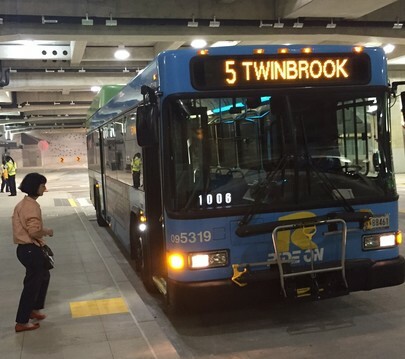 Wheels on the buses are going round and round at the Paul S. Sarbanes Transit Center in Silver Spring now that the three-story structure on Colesville Road has officially opened to the general public. The Transit Center, which opened in the early morning hours on Sunday, September 20, features more than 30 bus bays serving Metrobus, Ride On, the FDA Shuttle and the University of Maryland Shuttle, and provides a direct connection to the Red Line Metrorail station and the MARC train. In particular, Ride On has 20 routes that serve the center. New customer amenities are located throughout the fully ADA accessible Transit Center, including real-time bus departure information, public restrooms, water fountains, escalators, elevators, push-to-talk buttons, bike racks/lockers and neighborhood map displays. Taxi service and Kiss & Ride spaces are also available. The Silver Spring TRiPS Commuter Store has relocated to the Transit Center to provide in-person travel information and assistance. It is open from 7 a.m. – 5 p.m. weekdays. Montgomery County built the facility, and Metro is in charge of operating it. For more information on the Transit Center, including a directory map, visit www.wmata.com/bus. To improve efficiencies and better reflect traffic patterns, Ride On made adjustments to 22 of its routes. The changes took effect on September 20. Affected routes include 1, 5, 8, 9, 10, 14, 15, 16, 19, 20, 22, 26, 28 VanGo Free Circulator, 55, 56, 57, 58, 59, 60, 64, 70 and 98. 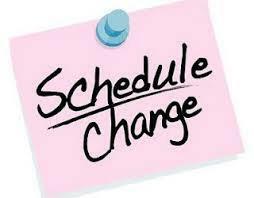 Click on a route to view the updated schedule. “We are improving our service within our resources to enhance the Ride On customer experience,” stated Carolyn Biggins, Chief of the Division of Transit Services. As the Maryland Transit Administration nears completion of the Takoma-Langley Transit Center, Route 16 has shifted slightly to access the new transit center. Northbound Route 16 will turn off New Hampshire Ave. at University Blvd. and continue onto New Hampshire Ave. via Lebanon Street. Riders are directed either to the bus stop on New Hampshire Ave. at Holton Lane or the bus stop on University Blvd. at Rite Aid until the transit center opens. Route 22 added three trips to the schedule due to demand. The Route 28 VanGo Free Circulator was revised to more efficiently access the new entrance to the Paul S. Sarbanes (Silver Spring) Transit Center. Rather than turning from Fenton Street onto Wayne Ave., Route 28 will turn right from Fenton Street onto Thayer Ave. and left onto Georgia Ave. This will eliminate four bus stops near the transit center while adding one bus stop on Fenton Street that serves the new Silver Spring library. It’s easier than ever to use a Youth Cruiser SmarTrip Card now that cardholders can tap it on the farebox when they board the bus. The card should be tapped on the farebox when boarding at all times, including during the Kids Ride Free period from 2-8 p.m. on weekdays. Money will only be deducted from the card, however, when it is used outside of the free period. Cash value or a pass must be loaded to the card to ride outside of the free hours. By tapping the card on the farebox, you’re helping us to better track the number of youth riders on our buses and maintain the support needed to continue the Kids Ride Free program. Do you want to put your video creation skills to the test? Ride On is looking for middle and high school students to help spread the word about Ride On’s free and discounted kids programs by producing a fun and educational video about the Youth Cruiser SmarTrip Card, the Monthly Pass, and the Summer Pass. Prizes include free bus passes, Ride On gear and the opportunity to have your video featured on the county’s website, Montgomery County Cable Television and Ride On’s YouTube channel. Entries should be sent to rideon.customerservice@montgomerycountymd.gov or uploaded to Dropbox.com by November 15, 2015. To view the contest flyer, entry form and rules, visit www.YouthCruiser.com. 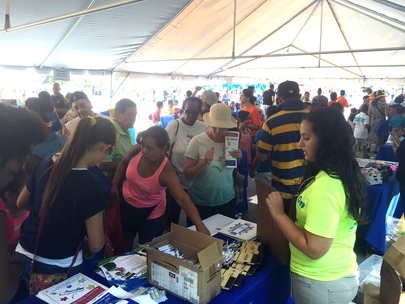 It was a hot and humid week, but that didn’t deter the 4,062 people who stopped by Ride On’s tent this summer at the 2015 Montgomery County Agricultural Fair in Gaithersburg. Ride On and MC311 staff took turns working shifts at the fair, which was held from Aug. 14-22. Staff answered questions, distributed schedules and gave out free gifts to the visitors each day. It was a busy afternoon for Ride On at the Montgomery County Public Schools annual Back-To-School Fair on Aug. 29 as hundreds of families flocked to the transit system’s table. Ride On teamed up with the school system, other government agencies, local businesses and community organizations at the event to help prepare students and their families for the upcoming school year. Staff used the outreach opportunity to educate visitors about the benefits of the Youth Cruiser SmarTrip Card, including how students can use it to easily travel home following after-school activities. The card can be purchased for $2 at all county libraries, TRiPS Commuter Stores and some schools. (Visit www.YouthCruiser.com for more information.) Thousands of giveaways – including drawstring bags, pens, coin purses, mini notebooks, coloring books, and pencils – were distributed. 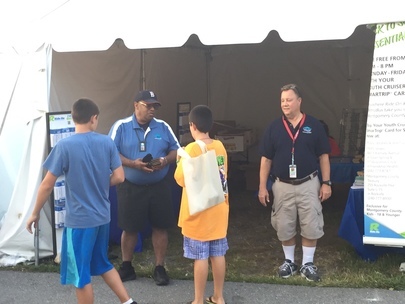 MCPS officials reported that more than 8,000 people attended this year’s fair, which was held on the grounds of the Carver Educational Services Center in Rockville. Look for updates on these projects in future newsletters. Do you have any questions, suggestions, or concerns that you would like us to address? Email us at rideon.customerservice@montgomerycountymd.gov to share your thoughts. We encourage you to share this newsletter on all of your community listserves and user groups. Thank you for supporting Ride On! Please do not reply to this email. Replies to this email will not be responded to or read. If you have any questions or comments, please visit the MC311 Portal at www.mc311.com or call 3-1-1 (240-777-0311 if outside the County) to speak with a Customer Service Representative.